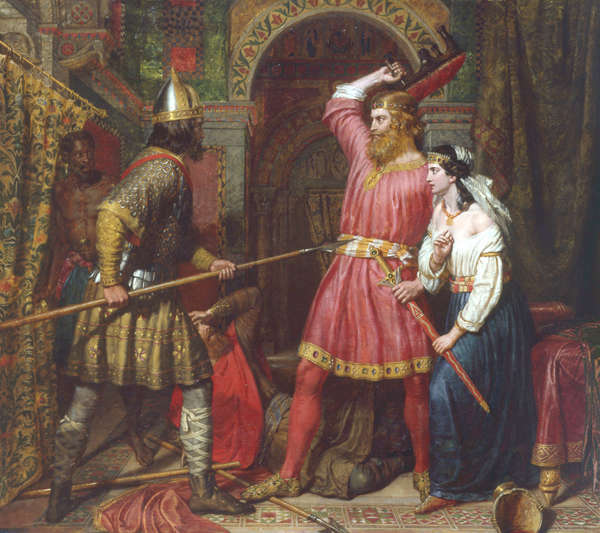 The Lombards or Langobards were an Eastern Germanic tribe. Their presence was in southern Scandinavia. In the 1st century AD they were mentioned as residents of the left bank of river Elbe (Labe). Publius Cornelius Tacitus mention that Lombards were small and independence tribe, who entered the composition of the Suebi Tribal League. 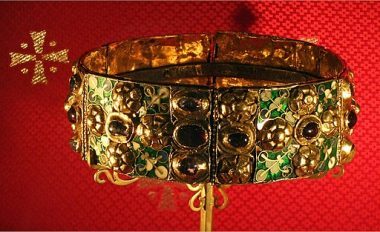 At the beginning of the 5th century, the Lombards reached the borders of the Western Roman Empire on the middle Danube. In 490 AD German leader Odoacer demolished the Eastern Germanic tribe Rugians in the former Roman province Pannonia. This was the opportunity for Lombards who crossed the river Danube and settle down around the coast of Danube. In Pannonia Lombards were imposed by Heruli or Herules, a powerful neighbour Germanic tribe. Lombards were finally fought for independence in 506 AD. Since the Lombards were good horsemen, the Eastern Roman Emperor Justinian I accepted them into byzantine army. After they supported Justinian in the war against Ostrogoth’s, in 546 Justinian officially allowed to Lombard king Audoin (546-560) to settle the area of ​​Pannonia. In the next period the Langobards were disturbed by the Eastern Germanic tribe Gepids. The Gepids were assembled by many other Germanic tribes and they founded the state on the east of Danube. Ačboin was the son of King Audion and the Frankish princess Chothsind. Alboin united the entire territory of Lombards, and in 568 he declared himself as King of Lombards. When he came to throne, Alboin decided to free Lombards from threats of Gepids. Since he hadn’t enough logistics and strong army, he entered into an alliance with Avars (Eurasian nomads). Lombards led by Alboin within support of Avars army, finally managed to defeat Gepides in 567. Kingdom of the Gepids has been fallen and king of Gepids Cunimund was killed personally by Alboin. After victory over Gepids, from the rest of Gepidia lands the Avars founded the Khaganate. Alboin was an ambitious ruler who had an aim to conquer Italy. At that time land of Italy, after the Justinian’s wars with Ostrogoths (535 – 554), were devastated. Alboin used such opportunity to occupy Milan and the valley of the Po river in 569, in 570 Tuscany with Florence and finally he occupied Ticinum (todays Pavia) in 572. After the conquer, Ticinum became capital city of Lombard Kingdom. Unlike Ostrogoth, the Lombards were intolerant towards the subordinate Roman population. They confiscated their property and collected a third of their income. Albion tried to resist in order to stop violence but he was killed while he was asleep. Alboin successor was a Cleph who ruled over Lombard kingdom only 18 months after he was assassinated. In the period from 574 to 584 the Lombards no longer elected king. The territory they conquered were divided into 36 duchies, which were administered by Lombard dukes. 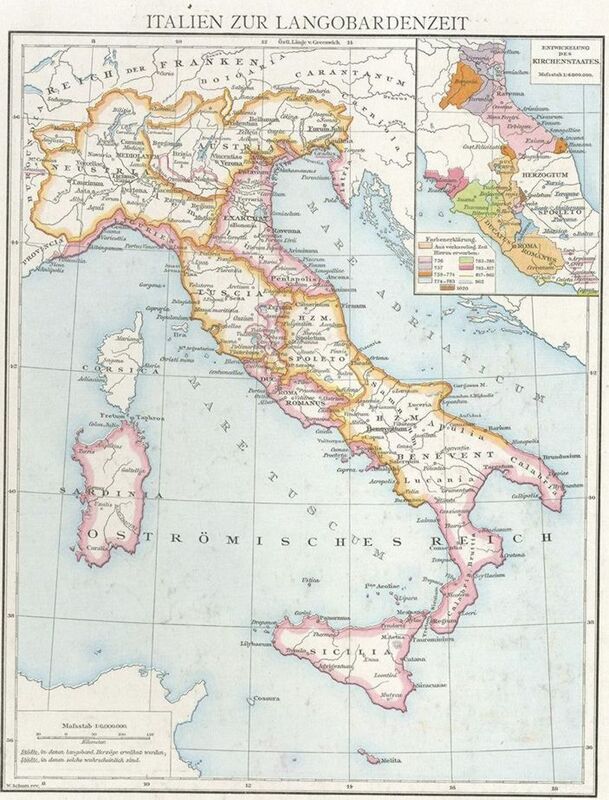 For example, in Central Italy, duke of Spoleto was founded, and in the south of Italy, duke of Benevento. Among them there were also: duke of Bergamo, duke of Brescia, duke of Friuli, duke of Trent and other. The disparity of Lombards used the Byzantine emperor Maurice (582-602). Namely, the Lombards did not conquer the whole territory of Italy. 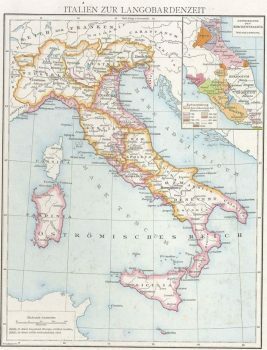 Thanks to its still strong fleet, the Romans preserved a number of areas: Venice, the Ravenna and region to Ancona in the south, the Capua province based in Naples, Calabria (ancient Bruttium), Apulia, Rome with its surroundings, Liguria with Genoa and the islands Sicily, Sardinia and Corsica. To save the so-called Byzantine Italy (term Byzantine Italy was used after the fall of Western Roman Empire), the Emperor Maurice decided to carry out military reform and a new administrative division. In 584, Byzantine Italy was divided into the duchies, and the supreme authority over all duchies was entrusted to the Exarch with the capital in Ravenna (so-called Exarchate of Ravenna). Exarch was primarily a military commander. He enjoyed the right to appoint or replace the officers, as well as the right to enter into alliance or terminate contracts with the enemy. Finally, he also had civilian powers. In the cities, the Byzantine emperor appointed the commanders with titles of magistri militium or dux. Nevertheless, the Emperor did not have enough resources and the army to bring his reform plan to an end in order to finally attack Lombards. That is why he entered into alliance with the Frankish ruler Childebert II (575 – 595) of Austrasia. In 584, the Franks infiltrated northern Italy and subdued a series of Lombard dukes. This circumstance will force Lombards to again elect a king, who will entrust a unique command over the army. He was son of the Cleph. After being elected as king Authari faced against rebels in Lombard territory, Franks and Byzantine Empire. Finally in 588 Authari managed to expel the Franks from Lombard borders. Authari also took the fortress of Comacchio. With this movement he cutoff communication to Byzantine between Padua and Ravenna. King Authari in 590 tried to negotiate with Childebert II but suddenly he died probably due to the consequences of poisoning. Agilulf as a duke of Turin (589-590) was known as Thuringian. After he was elected for king of Lombards in 590, Agilulf was consider as the true founder of Lombard power in Italy. His first move was solving the issue of the Franks threat. He was willing to pay an annual tax to Franks under condition that Franks don’t attack his land. Then, in order to strengthen the position inside of Lombards territory, Agilulf managed to take control over the Lombard dukes. Finally, he decided to extend his power to the territory of Byzantine Italy. In 592 Agilulf captured Perugia, which he breaks the line between Ravenna and Rome. His Duke of Spoleto occupied Rome. At the time, Pope Gregory and the Great (590 – 604) were engaged on the political plane. In the Lombardian devastation, Pope Gregory saw the danger not only of Italy, but also of the church organization. Namely, the Church relied on cities as episcopal seating, which were now destroyed by barbarians. That’s why Pope Gregory in 593 offered Agilulf to pay him the tribune. In return, Agilulf give up from Perugia and stop his plans of sieging Rome. In the next few years, the Pope Gregory retained the “eternal city”-Rome with skillful diplomacy, but Padua, Cremona and Mantua were conquered by Lombards in 602. During the reign of Agilulf the Lombards, although mostly pagans and Arians started to convert into Catholic religion. At the end of his life, Agilulf appointed his son Adaloald as his successor. Adaloald (602-628) was to young when he became king so his mother ruled as regent. After Adaloald died in Ravenna under the mysterious circumstances, duke of Turin Arioald became new king of Lombards in 626. Since Arioald did not tolerated Catholics he reestablished Arianism. During the ten years of his rule, the only important event was the successful defense of northeastern Italy from Avars. New Lombard king Rothari of Rothair renewed the War against Byzantine Italy. In 640, Rothair captured Liguria, and his Duke of Benevento captured Salerno in Campania. However, Rothair was known with law so-called Edictum Rothari codified in November 643. It was a collection compiled in Latin, and devoted to Lombardian custom law. Although in 652 the Byzantine Emperor admitted to Lombards all their conquests, it was only a matter of time when would the Byzantine emperor start a new war in order to free Italy from Lombards.